It's been several years since peace settled in Metro City. With Cody and Jessica on vacation and Guy resuming his training out of town, everything seems to be in order. But recently, Haggar is feeling uneasy after learning that Mad Gear was not completely destroyed. Once again the Mad Gear Gang has emerged and this time they want revenge. They'll stop at nothing to bring Haggar and the entire world down to its knees. This time they've kidnapped Guy's master, Genryusai and his daughter, Rena. Now Haggar must travel the four corners of the globe to search for Genryusai and Rena. With the help of Maki and Carlos, the reign of the Mad Gear Gang will hopefully be destroyed. --From the SNES Final Fight 2 instruction manual. 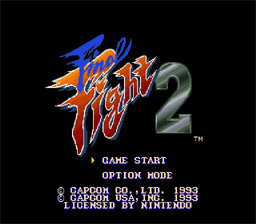 Play Final Fight 2 Now!